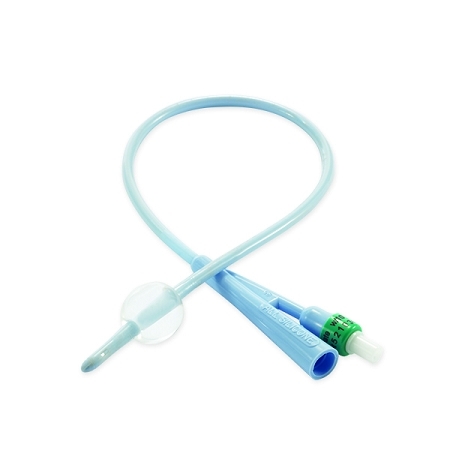 Dover 100% Silicone Foley Catheter Inert material preferred for medical devices means less urethral irritation and stricture versus latex material, less encrustation compared to latex catheters, and it's 100% Latex-Free. Smooth, separately molded, reinforced tip resists buckling. Deep stylet pocket accepts stylet securely. Bullet shape eases insertion, causing less tissue trauma. Smooth, hand finished eyes means no additional urethral trauma. Large, oval shape is ideal size for maximum drainage & design will not allow material to obstruct drainage lumen. Ribbed balloon increases strength & symmetry. Smooth balloon-to-shaft transition eases insertion. Soft, flexible, non-rigid shaft allows for easy insertion, comfortable silicone. Round, smooth, uniform, French-sized surface reduces irritation to urethra. 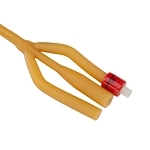 30% larger inflation lumen due to patented extrusion process allows for greater flow rates. 21% larger inflation lumen means fast, easy insertion. One wall construction due to patented extrusion process resists collapsing during forced irrigation. 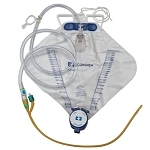 Separately molded, ribbed, reinforced funnel assures proper seal-to-drain bag connector & various irrigation syringes. 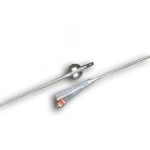 Bespak spring-loaded valve provides consistent inflation/deflation of Foley catheter balloon. 100% Silicone Material: Inert material preferred for medical devices, Less urethral irritation and stricture versus latex material, less encrustation compared to latex catheters, 100% Latex-Free. Tip - Smooth, separately molded, reinforced tip: Resists buckling. Tip - Deep stylet pocket: Accepts stylet securely. Tip - Bullet shape: Eases insertion, less tissue trauma. Eyes - Smooth, hand finished: No additional urethral trauma. Eyes - Large, oval shaped: Ideal size for maximum drainage & design will not allow material to obstruct drainage lumen. Balloon - Ribbed balloon: Increases strength & symmetry. 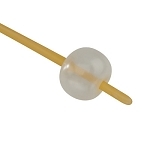 Balloon - Smooth balloon to shaft transition: Eases insertion. Shaft - Soft, flexible, non-rigid: Allows for easy insertion, comfortable silicone. Shaft - Round, smooth, uniform French sized surface: Reduced irritation to urethra, true french sizes. Shaft - 30% larger inflation lumen due to patented extrusion process: Allows for greater flow rates. Shaft - 21% larger inflation lumen: Fast, easy insertion. Shaft - One wall construction due to patented extrusion process: Resists collapsing during forced irrigation. 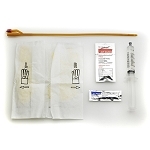 Funnel -- Separately molded, ribbed, reinforced: Assures proper seal to drain bag connector & various irrigation syringes. Valve - Bespak spring-loaded valve: Provides consistent inflation/deflation of Foley catheter balloon.